Stem cells in the brain can divide and mature into neurons participating in various brain functions, including memory. In a paper scientists have discovered that the flow of cerebrospinal fluid is a key signal for neural stem cell renewal. The ancient Greek aphorism panta rhei means “everything flows”, a phrase used by philosophers to describe the constant flux and interplay between the past and renewal. 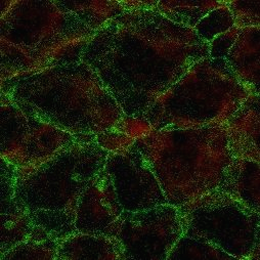 A recent paper lends this relationship a whole new meaning: a team of researchers headed by Professor Magdalena Götz and their collaborators from the LMU (Professor Benedikt Grothe, Chair of Neurobiology) and the Henrich-Heine University Düsseldorf have discovered that the flow of cerebrospinal fluid is a key signal for neural stem cell renewal. The cerebrospinal fluid fills the brain and its roles are still ill understood. This work highlights the role of this fluid as a key signal – but this time not a chemical but a physical signal. Götz and her team, under the guidance of lead author Dr. David Petrik, discovered that brain stem cells are also influenced by the physical forces of the fluid flow. Further tests showed that the function of ENaC is augmented by shear forces exerted on the cells by the cerebrospinal fluid. The physical stimulation causes the channel protein to open for longer time and allow sodium ions to flow into the cell, thus stimulating division. “The results came as a big surprise, since ENaC had previously only been known for its functions in the kidneys and lungs,” says study leader Götz. She and her team now want to better explore the fast signals mediated by ions in stem cells and clarify the extent to which the findings are also relevant to treatment. After all, pharmacological ENaC blockers are already used clinically to relieve certain types of hypertension. Now it is known that they can also influence stem cells in the brain and thus brain function.